Tea for three or more! Want to make friends, then why not share a pot of beautiful fresh herb tea ! We have a range of fresh grown herbal teas to tantalise the palate and perk up the dulled senses . Run your fingers through the glossy stems of our fresh mints …what about the luscious chocolate peppermint ? Smooth ,seductive and sensual.Rolls into your mouth like a melted After Eight.. The type of After Eight eaten in bed with a wanton lover..and melted on your pillow . The type of After Eight forgotten after a late dinner party but found lurking secretly in the box and eaten with subterfuge and secret glee.The type of After Eight slipped into a leather glove and carried away to a smugglers den where general carousing and making merry may be happening with riotous abandon.You know the type of scene- buxom,garralous serving wench,handsome highwayman with a swagger and a lascivious smile,all tight leather pants and a glint in his eye,and an accommodating dry cleaner.What about the charming rustic , all corduroy and sweaty singlet and a can of coke in his pocket ? Just ready for that advertising break.Or the handsome man of mystery, floral chemise,cravat and oh so creased linen suit -dragged through a haystack with the boys and then took a ride on the hay wagon . So we too can be the wild rovers of taste, the robin hoods of flavour and the buccaneers of balm .We are the prairie tea queens ! Anyone for tea, Vicar ? 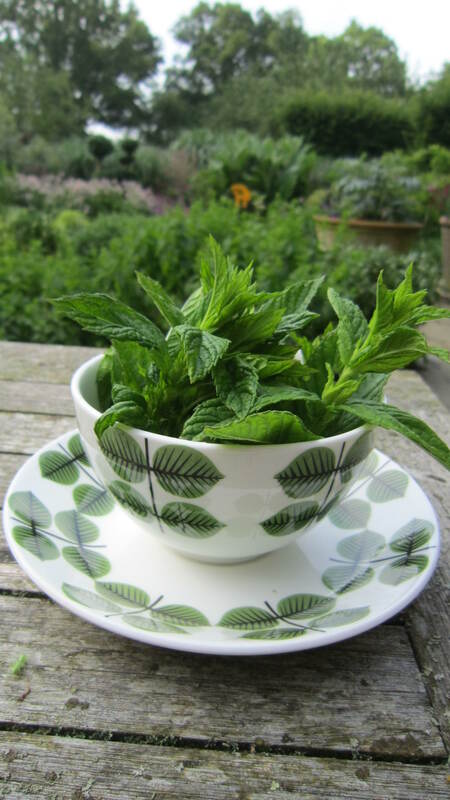 This year we are promoting and growing herbs for our “cut it now” herbal tea range ! 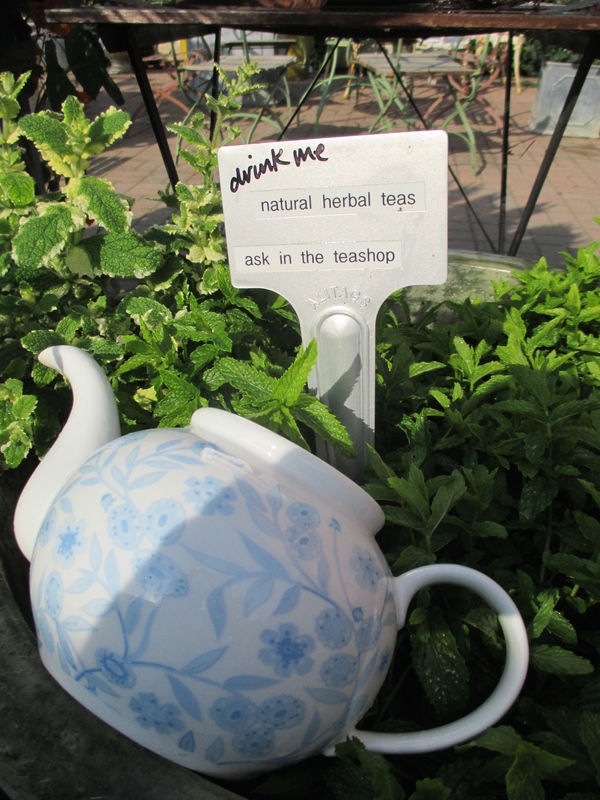 growing on our terrace at our teashop we have the most amazing range of possibilities for your healthy cuppa ! Why would you choose the dry and dusty alternative in a teabag when you can take our fresh leaves and enjoy the fresh and invigorating aromas coming from the freshest ingredients. It is a simple recipe after all … leaves + hot water and drink ! So when you reach for our Tashkent mint you are reaching for a world beyond the teatable……imagine the exotic lure of the spice trail.. the irascible hot sweaty camels and their enigmatic drovers swathed in grubby silks and manmade fibres.. the glint of a golden tooth here.. the chink of a wanton coin encrusted sandal there… there is a snort and the flap of the Bedouin tent and the seamless shift of a thousand sands and a thousand grains of sand transports you beyond the norm. many other fresh herbs are available ! If you like the idea of a leap from the teabag into the realm of the senses ..a cup of chocolate peppermint perchance, a smooth apple mint, nay pineapple, camomile lawn : give it to me in a cup, lemon balm my soul….the teas are endless the aromas subtle stimulating and the colours .. give me zing, give me laughter, give me love ! George Orwell was there ( in the Indian Imperial Police a long time ago , and went a bit native… never did find out what those strange blue tattoos meant on his knuckles !) and we have just come back from there (without the tattoos ): Burma or should I say Myanmar..
… an oriental 3D jigsaw of a place , layered and laquered like an intricate tiffin box . A positive riot of smells,and sounds assaulting the senses and catching you unawares, like the lethal pavements where you could plunge up to your oxters in raw sewage as soon as wrick your ankle on the vertiginous extreme levels and gradients. It’s a tricky one crossing roads in Yangon where the traffic never stills and the utterly laughable zebra crossings are there to decorate the highway rather than offer any semblance of safety.Far better to cling to the shadow of a local and launch midstream into the swirling morass of bicycles , scooters and cars adopting a haphazard weaving technique and selective blindness to the moving hardware bearing down upon you. Humidity being well up in the uncomfortable levels ,a cup of tea so fits the bill(after cocktails at the Strand Hotel of course) . On arrival we tentatively sampled an unknown box of leaves found in our hotel room and made a brew. 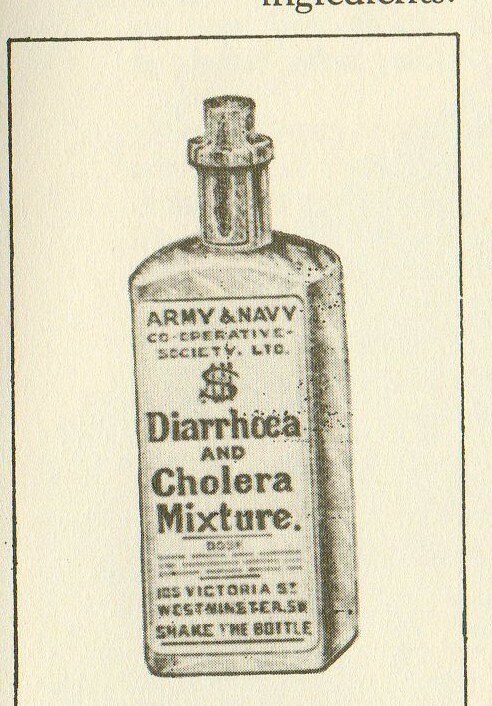 Why did we assume it was a box of tea leaves rather than say , an enema , or viagra supplement ? A mouthful of sticks,leaves and twiggy slithers would have suited George O right down to the ground but for the more discerning palette it was a little on the ascetic side of pleasurable . Later , drying piles of herbage seen on the streets explained everything and that gritty , road planings aroma told the tale. 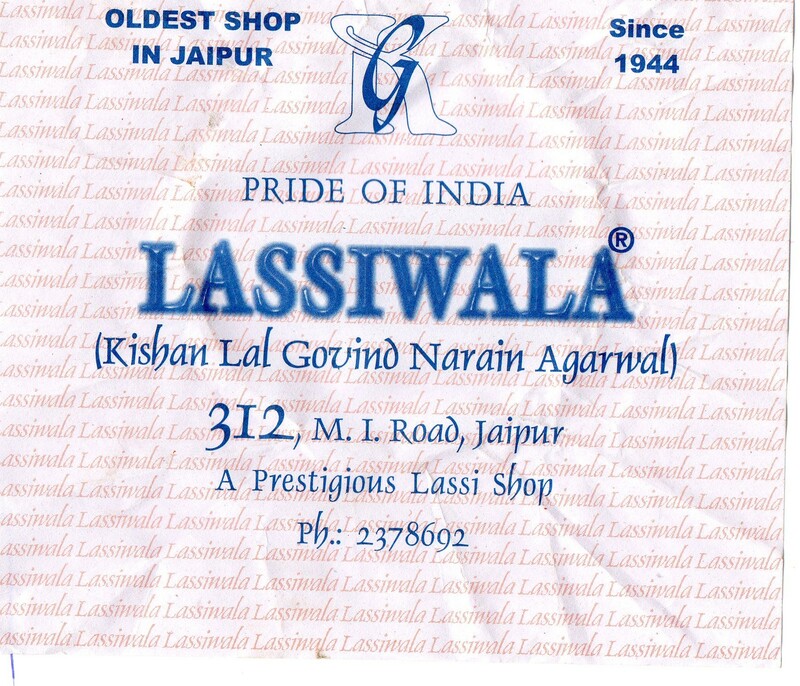 India Diaries : Lassie ! heel ! Intestinal flora and fauna : the ugly truth . There is probably one thing you can continure to drink with impunity throughout any stay in India and that is Lassi. Simplicity itself, it is a gorgeous yohurt drink, and when made properly can be a smooth silky frothy yoghurt shake of a thing .. when made in a slapdash way can be a watery torpid soup.So it is simple and can continue to be made back at home . Take some yohurt , blend it up with milk and drink it. Even when the dangerous bacterial bacillus get you down in India ,(an inevitable consequence ) a lassi is pretty much the only thing you can face across the breakfast table. This time around our trusty driver Prakash treated us to the best lassi ever bought from a suspiciously tidy little kiosk in Jaipur (the oldest lassi maker in the world I think) . Served in a beautifully conical handcrafted terracotta pot it was amazing ! struggled to bring the pots home and I can see them here on my terrace strangely foreign and bereft of their colleagues.There were piles of them in the shop towering like mini towers of pisa ! Of course there are different types of lassi available , from the sweet and salted to the rather more racey “Bhang” variety . The Bhang version being the same thing blended with marajuana.. which is readily available in some rather wacky Bhang shops and a certain dubious pizzeria in Pushkar. I am not sure where the “bhang” comes from .. but is probably the description of your eyeballs after you have partaken of the same and bang goes your life from henceforth. Talking of the pizza parlour (too grand a name for it although it had a rather authentic looking pizza oven ) we were treated to the rather dodgy way of getting around the delicate issue of an alcohol ban within the town limits.Cerveza beer arrived wrapped in a tin foil shroud accompanied by a tea cup from which to drink it. This same thing happened on our trip last year when in Jodphur we were invited to order “coffee” (kingfisher beer) and it was served in mugs.We also got on rather well with a very miaowy cat here which rather liked L’s pizza crust. Another beverage to which we are particularly partial when in India is the wonderful and strangely spicy Chai.It is an exotic tea with a difference created by boiling cold water, milk, sugar,tea and spices in one pot (of dubious cleanliness ) and creating a murkily opaque super sweet concoction.In earlier times this was served in a cute little terracotta cup which one would dash to the ground after drinking and all would be well with the world and ones constitution. The ground would be littered with vicious shards of terracotta but hey !! Today it is often served in eerily unclean and gloomy looking cups with a most unhealthy pallour and certain charming grubbiness.The trick is to avert ones eyes from the insanitary kitchen arrangements . 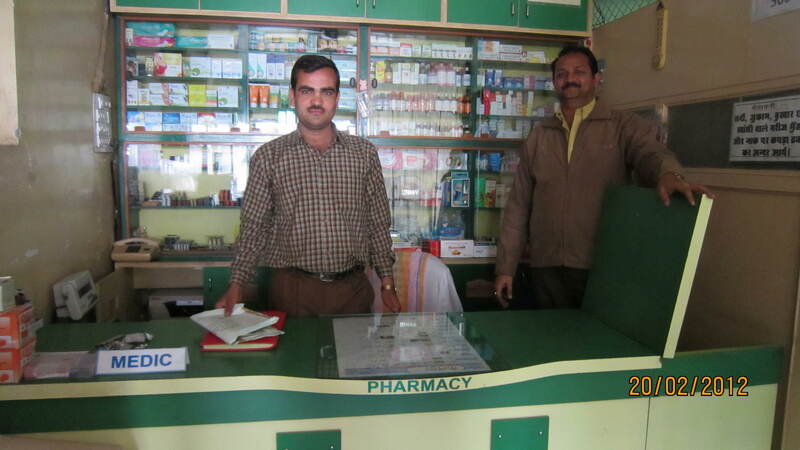 No ill effects from the various chai pitstops although we did have to visit a charming pharmacy in Pushkar for cough medicines , lozenges and cold remedies. Here are the pharmacy boys in situ !